Ticks that transmit Lyme disease also may be carriers of co-infections. Research has discovered more than a dozen tick-borne diseases in the Unites States, with new ones continually being identified. A single tick can carry multiple diseases. 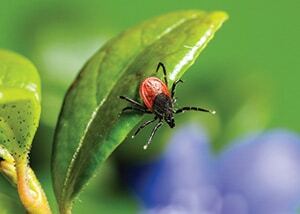 It is rare that a patient with Lyme disease is not also infected with co-infections. In Lyme epidemic areas, it is estimated that the rate of co-infections in people with Lyme is 39%-60%. There is not a lot known about co-infections, contributing to the complexity of tick-borne diseases. The presence of co-infections adds an additional layer of severity to the disease and results in acute symptoms, treatment complications, unreliable testing, an increased rate of relapsing, and a longer recovery. Symptoms: Malaria-like illness, fatigue, crawling sensation in skin, drenching sweats, fever, chills, weakness, weight loss, electromagnetic field sensitivity, nausea, abdominal pain, imbalance, diarrhea, cough, shortness of breath, headache, muscle and joint pain, dark urine or blood in urine. Complications include liver problems, hemolytic anemia, and very low blood pressure. Description: Composed of gram-negative, aerobic bacteria. It is an intracellular organism that multiplies in red blood cells. It is commonly carried in cats and can cause cat-scratch disease. Symptoms: Swollen lymph nodes, severe pain in the tibia and soles, vertigo, ear pain, sore throat, anorexia, psychiatric symptoms, and an unusual streaked rash. Suspect Bartonella when neurological symptoms are out of proportion to general symptoms. Description: Not a tick-borne disease, but should be considered a secondary infection, as it frequently exists as a systemic fungal infection in Lyme patients. It is naturally occurring yeast that lives within the human digestive system, mucous membranes, and skin. Description: A serious bacterial infection of the gut. It is a common infection for patients to acquire who have been on antibiotics. Description: Generally not tick-borne, but often share the same symptoms and can affect the success of Lyme treatment if not addressed. Common names: Roundworm, Pinworm, Schistosome fluke, Hookworm, Beef worm, Pork worm, Tapeworm, and many more. Description: A genus of small bacteria, which hides intracellularly and invades multiple organs and systems. Often found in the oral cavity, gut flora, lungs, reproductive tract and superficial body parts. Description: It is a protozoan (parasitic) infection. It is known as the Fry bug, and it is protected by biofilms, which contributes to chronic infection. Description: Gram- negative bacilli that are obligate intracellular parasites. Symptoms: High fever, severe headache (especially behind the eyes), maculopapular skin rash. Symptoms: Paralysis begins in legs and spreads throughout the body within hours. Reversed when tick is removed.